Much Ado About Nothing is technically considered to be a Shakespearean ‘comedy’ of the classical kind; indeed, it’s even frequently taught at KS3 owing to its frequent comic tone. The witty and entertaining exchanges between the main protagonists Beatrice and Benedick have been the subject of much literary criticism and are often considered to be the most engaging and enjoyable parts of the play in performance. The parallel story within the plot of the relationship between Claudio and Hero is therefore conventionally seen as the lighter, perhaps more one-dimensional and, frankly, rather implausible counterpart to the gritty and seemingly more ‘realistic’ relationship between Beatrice and Benedick. 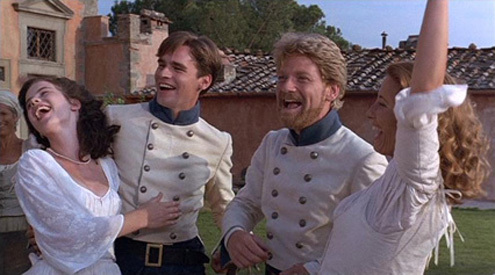 However, like many examples of literary ‘comedy’, Much Ado About Nothing also has its dark side, with constant reminders that – had things gone only slightly differently – a tragedy could have ensued. As a result of this approach, Shakespeare’s Othello provides an interesting complementary text, with a comparison of its villain, Iago, with Much Ado’s Don John being particularly illuminating. This will be particularly useful for A Level students for whom the knowledge and application of generic features is relevant to their examination marks. It could also be beneficial for them to be able to recognise how the difference between comedy and tragedy is not as clear cut as they may suppose.